Reefer trucks are among new sub-segments which are seeing demand in India. Put your heart, mind, and soul into even your smallest acts. This is the secret of success. So says Swami Sivananda, a spiritual teacher and a proponent of yoga and vedanta. It’s something Tata Motors is actively working on since it embarked on its turnaround strategy last August, with an avowed target of regaining 5 percent market share in both its commercial vehicle and passenger vehicle businesses. Since then, Tata has engineered a remarkable return to good times. From a CV market share of 39.81 percent in June 2017 to 45.90 percent in June 2018, and a PV market share of 5.45 percent in August 2017 to 6.75 percent in June 2018, it's a smart return to form. In terms of financial performance, in Q1 FY2018, the company reported consolidated revenue of Rs 67,081 crore, up 14 percent. For the domestic market, Tata reported revenue of Rs 16,803 crore and PAT of Rs 1,188 crore. The Q1 FY2019 results see Tata Motors’ net revenue and the operating profit at its highest since Q1 FY2013. Firing up the company’s performance is the CV business unit. Having lost much ground in the domestic market in the first quarter of FY2018 due to constraints in BS IV-compliant products supply capacity, it has recorded speedy growth from Q2 FY2018 onwards. The company has almost doubled its sales and despatched 111,642 units in Q1 FY2019, which marks 71 percent YoY growth (Q1FY2018: 60,446 units), in the process increasing CV market share to 45.90 percent from 39.81 percent. “We have a target to grow profitably, and we are looking at market share. We have grown well in Q1 FY2019, grown our market share in all segments and overall have grown by around 5.2 percent,” says Girish Wagh, president-Commercial Vehicle Business Unit, Tata Motors. The government notification has added much work not just for OEMs but also the component supplier base, which may impact future supplies. “When we started looking at those norms, we also broadly decided the aggregates that are going to change, and what the changes will be. We also started interacting with the suppliers; tyres will be one major area. There are some capacity constraints from that perspective, but we have indicated what the demand mix will be, going ahead. They are working on it but there are other suppliers who have to adjust to this kind of demand mix. As of now, the clarity is not there; it is emerging with every passing day. But clearly, there is going to be changed in the demand mix at the component and aggregate level,” explains Wagh. India Auto Inc is currently experiencing one of its disruptive phases with the BS VI, CAFE (corporate average fuel economy), safety and other norms, which translates into making huge investments. In a way, this means the component industry is facing a tough time accessing the funding required to upgrade capabilities and deliver the required results. The CV market leader, being a full range player – LCVs, ILCVs, M&HCVs and trailers – has its own advantage. 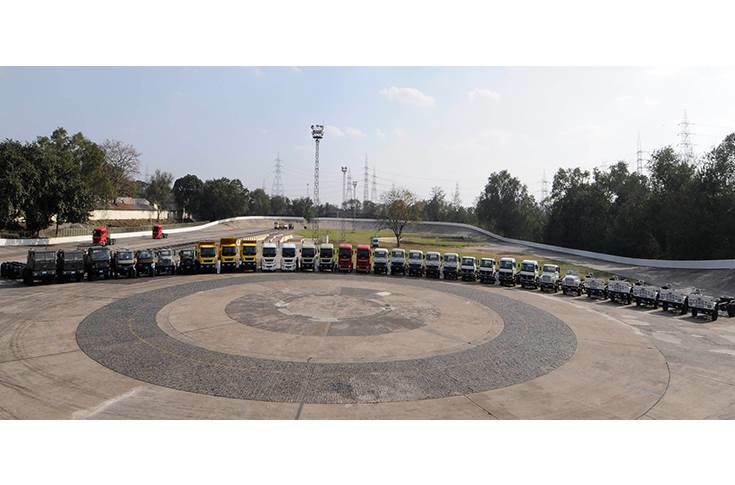 Wagh cites how existing customers can look at upgrading their fleets with a range of products from the Tata Motors’ stable, along with the advantage of having a huge network that allows for speedy servicing. Girish Wagh: "We have studied the new axle loading norms for trucks and they clearly call for re-engineering of vehicles." In line with its mission to improve the bottom line, the company has appointed four business heads to look after each segment – M&HCVs, I&LCVs, SCVs and the pickup and PVs product lines. Wagh says these business heads take “their own decisions in terms of product planning, supply chain and product development, among other things.” This allows the company to be agile and plan its offerings better. “They are tuned into the market on a continuous basis to understand what needs to be done. Because there will be some changes that will be required to be done dynamically, it addresses the regulation part and also, more importantly, the changing customer requirements. The requirements are changing and all this is being done to understand what kind of products we need to make. These product heads were appointed a year ago, around April 2017,” explains Wagh. In terms of investments, the company has earmarked around Rs 1,500 crore to address R&D, manufacturing capex and also manufacturing of new products that includes tooling. According to Wagh, the company will incur an additional expenditure of around 10-20 percent on the back of BS VI norms. According to Tata Motors, its advanced engineering has been working on many areas, taking into account different scenarios and technology in the market. It has been working on alternate fuels, HCNG, electrification and fuel cells. Wagh adds that Tata Motors, which has received orders for around 200 electric buses, has seen new demand come in various cities and municipal bodies, taking its total order book to around 290 units. Deliveries are expected to begin in the second half of this year. Market demand-wise, the company says that the “mother requirement” remains of improving TCO but at the same time new duty cycles are also coming up. “If you see the e-commerce segment, there are customers who are promising turnaround time to their customers, who use their vehicles in different duty-cycles. Therefore, from that kind of duty cycle, we have to look at driver comfort, and the new set of calibration because of the speed that they are operating. This means customer requirements are going up and from the point of view of either reducing the total cost of operation or increasing total revenue from operation. So it could be comfort, convenience, product requirements or service requirements too. We see a lot of changes happening and thus are working with such demanding customers that help us to develop new offerings,” adds Wagh. Speaking on the road ahead, Wagh says that Tata Motors launched around 50 products last year, and this year the trend will be similar. “In terms of new segments, it depends on how one segments them. There are multiple dimensions of segmentation. And if you look at it from the end-user perspective, you can create more segments, for instance in the Ultra range, the reefer (refrigerated van) itself was one product. From that perspective, we will continue to look at every dimension of the segmentation and what can be done and what we can do to address the needs of the customers,” concludes Wagh.